Primary research is research that a writer goes out in person to collect by themselves. Whether you write fiction or non-fiction, at some point you will have to do research. This type of research is invaluable, as it going to help writers in each of their writing projects. Now that we understand primary research, we must understand why we would use it. Many industries across the board use this type of research. Here are a few examples. I’m sure you could think of more. An author is writing a historical novel. S/he wants to make the setting and characters genuine and authentic for the reader. A police detective is solving a crime. They conduct primary research to find out more about the victim and what may have made them a target. A person is a public figure and internationally known. A student may perform public research to write a research paper on them. Before you conduct research, you have to ask yourself why you are doing it. What do you want to discover? This is your research question. Your subjects are the individuals which you will talk to or observe through interviews or surveys. Likewise, ask yourself what your biases is about the topic. Biases is how favorable or unfavorable you feel toward a topic. By the time you are finished, you should have plenty of research and data to analyze. How you do this is going to vary in your prewriting. Some prefer to use a program such as Excel, while others use mind maps or Venn diagrams. Outlines, too, are also useful. You have to organize your research in a way that makes the most sense to you. I find the easiest way is to outline by how it will appear within the written form. You don’t have to write down everything, but only write down (or highlight) the information which you need. 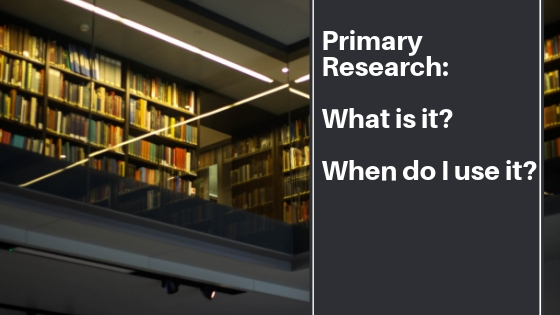 Finally, when do we use primary research? The truth is, you can use it anytime. Be aware of ethical boundaries, however, that surround this type of research. If you’re interviewing people, get their permission beforehand. Ask: May I use your name in my story…book…whatever the case may be. You don’t want cause emotional harm to your interviewee so always play on the safe side. Furthermore, objectivity vs. subjectivity may be of concern. Objectivity is when you remove your biases and opinions from your research. Consequently, subjectivity is when you insert biases and opinions into your writing. You want to remain objective and allow your readers to come to their own conclusions concerning your topic. This means that you present both sides of the argument in a fair and balanced way. This type of research depends on your purpose. Be accurate in your research; however, keep your research in a file. This makes it possible to utilize the research later for future projects. Keep it in a filing cabinet once you’re through using it. File the audio files on the cloud or a CD-ROM. Sooner than later you’re going to have your own research library of which you can access at any time. This is going to be invaluable as a writer.